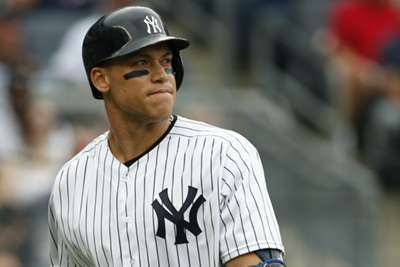 New York Yankees All-Star Aaron Judge has become frustrated with the amount of game time missed as he recovers from a broken wrist. Judge has been sidelined for three weeks and there is no clear timetable for the Yankees slugger to return to MLB after suffering a bone chip fracture in his right wrist last month. The Yankees initially thought Judge would be able to return after three weeks, but general manager Brian Cashman revealed the 26-year-old is healing slower than doctors originally anticipated. "I'm not frustrated with the pace [of the healing]. I'm frustrated with being out," Judge said on Thursday. Judge, however, is remaining patient and said he does not want to return before he has completely healed. "I've got a broken bone. It's still fractured. I've got to give it time to heal," Judge said. "Just got to make sure I'm 100 per cent before I got back out there because I don't want to have a setback. "I've just got to keep myself busy during the games and try to do anything I can to help the team," he added. "Even though I'm not out there playing, I want to try to do stuff to help the team win, if that's either talking to a guy, motivating a guy or saying a little something, pick someone up, just trying to keep myself busy." The two-time All-Star is hitting .285/.398/.548 with 26 home runs and 61 RBIs in 99 games.